This resumes the strategy for Northrend Beasts as begun in Part 1 of the guide. About fifteen seconds after Gormok is slain, the jormungar Acidmaw and Dreadscale will be released into the arena and become active. Each tank should be prepared to pick up their target, and healers should throw extra healing on the tank that still has Impale ticking from Gormok’s phase. Both worms need to be faced away from the rest of the raid, including the opposite tank. Healers must be within range of both tanks and as much of the DPS as possible. Because of this, healers have priority in finding position, and ranged should adjust around healers. No person should ever stand in the Slime Pool, which lasts twice as long in Heroic. All DPS should focus on Acidmaw until it is slain, and Heroism/Bloodlust should be used shortly after tanks establish initial threat to help down the jormungar as quickly as possible. When players receive Paralytic Toxin, they must move to the person who has Burning Bile as quickly as possible. Before the first submerge, this is the tank on Dreadscale. That tank must be prepared to adjust their positioning to reach any paralyzed targets. After the first submerge, Acidmaw’s tank will become vulnerable to the toxin, and Burning Bile will be cast upon a random raid member. Communication is vital, and raid members should be prepared to move to any target affected by the toxin long enough to break them free before spreading out again. Once Acidmaw is down, Dreadscale will enrage. Dreadscale’s tank will continue to tank, while Acidmaw’s tank will continue to gain threat on Dreadscale in case the tank dies (only one tank needs to survive for Icehowl.) Healing becomes crucial on Dreadscale’s tank at this time, and both healers should focus on keeping the tank alive. Once Dreadscale is defeated, the raid will shift into positioning for Icehowl. As Dreadscale is in its last 5% of health, Acidmaw’s tank should shift to moving in position to pick up Icehowl. If only one tank is alive and tanking Dreadscale, they must wait until Dreadscale is fallen before moving into position, and DPS must be prepared to hold off DPS until the tank has established aggro. The positioning diagram to the left illustrates the basic positioning for Icehowl, which will shift position along the walls after each Massive Crash phase. As before, Icehowl is essentially a tank and spank style fight. The tank will endure more damage, as will the raid during Arctic Breath and Massive Crash, but the fight remains the same except for one key change: players will no longer receive a speed boost after Massive Crash. 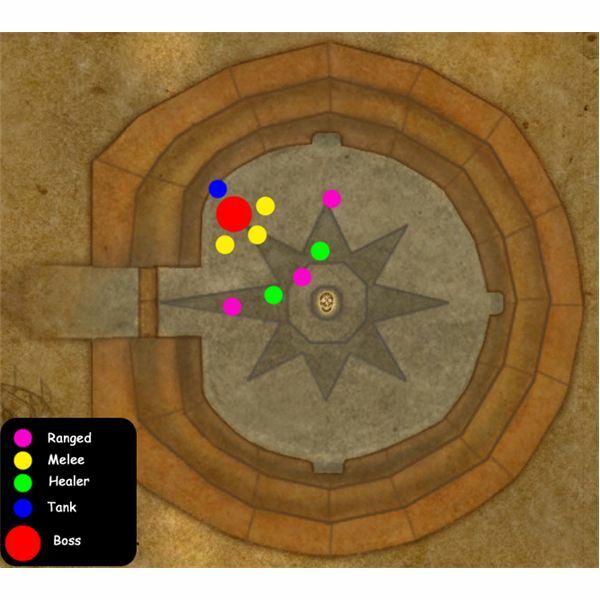 Ranged and Healers should move behind the center of the arena on the opposite side, and spread out, just a few seconds before Massive Crash initiates (Deadly Boss Mod timers help with this.) This helps spread out the raid and minimize the chance of multiple players being caught in the path of a charge. Just before a Massive Crash, players should check to see approximately where they will be thrown against the wall, and move if they will be caught in one of the many corners or inside a gate, as it is harder to flee these areas. During the stun of Massive Crash, players should position their cameras and hold down both mouse buttons in advance so they will begin moving as soon as the stun wears off. Players should also hold a strafe key down. Players should always cross to the far side of Icehowl, never in front. Deadly Boss Mods will also ping the area of the map and mark the player targeted by a skull. This is the most reliable method of knowing where the charge is aimed, as Icehowl does not always face properly in a graphical sense. After each successively dodged crash, DPS should rush in to do as much damage to Icehowl as possible, including using cooldowns and trinkets. The tank should position themselves in front of the stunned Icehowl and tank him where he stands, making sure he remains positioned facing the wall. The raid will take a moderate amount of damage between Crashes, and it is essential that these are fully healed through, as the next crash can kill raid members if they are not at high health. If DPS remains high and most raid members live through each phase, Icehowl will be down in about three or four crash phases. Congratulations on besting Northrend Beasts on heroic! To see what loot is available, take a look at WoWhead’s list.